Please note that the new screen will reach groups of TypePad users in phases over the coming weeks. Some of you will see these changes today and everyone will see them by mid-June. We are working to get them to everyone as quickly as possible, and we appreciate your patience while we do so. You asked for an easier way to align images and text. Now you can do this with a single click without diving into the HTML code. 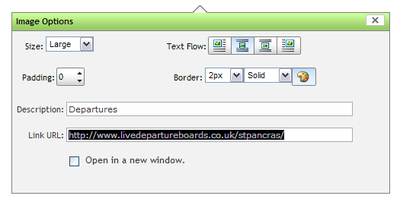 Editing images once they are inserted in your compose window is now a lot easier. Click on the image thumbnail to add details, like a description or website address. Or, finesse the format with customized borders. Sometimes it's the little details that make a blog truly unique. The font tools have always allowed you to change the font size and text color, but now you can choose your font style too. So if your style is more Lucida Console than Comic Sans MS, your blog can reflect that. Many of you wanted an easy way to set links to open in a new window so your readers wouldn't have to navigate away from your blog. Now instead of hand-coding the link options, you can just check a box. Extended entries present just a short introduction (or first paragraph) to show what a post has in store, and then offer a link to read more. Instead of typing your extended entry in a separate box, now you simply add an "extended entry line" into the compose window and drag it where you would like the text to be separated. We haven't taken away any of the Compose tools you've already been using. Favorites like Markdown are here to stay. Read the full details about the changes and watch a screencast featuring the new Compose screen in this Overview of the New Compose Editor. A few things to note: As always, our wonderful Beta team members have helped us with testing these improvements, and have spotted a few issues that should be fixed in the next week or two. You can find out more about them on the Known Issues list. And don't forget, the new Compose screen is launching in phases, so don't panic if you don't see the changes for a few more weeks. We appreciate your patience as we roll out these improvements! If you have any questions, please contact our Support team. These new features are just the beginning of many exciting developments at TypePad. We look forward to hearing what you think in the comments.